In vibratory feeder setting, new builders typically already understand the basics of welding and can sufficiently execute simple welding exercises. The real learning process begins when recruits learn how to build a “basic”, the earliest form of a vibratory feeder. Because there is no text or informational video that truly captures how to construct a vibratory feeder, trickle down knowledge is the only way to fully understand the craft. After learning to build “basics”, the recruit works with one or more experienced bowl toolers to begin the next step of the learning process. New centrifugal feeder builders begin by assisting a more experienced builder, and performing some of the tasks that provide a backdrop to tooling and functional processes. This way, the new builders are close to the core process of building and tooling a feeder while acclimating to the shop environment learning simpler processes and procedures. 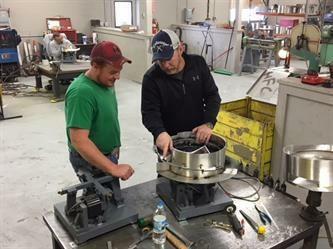 There are classes that exist that may offer instruction for some of the processes required to build centrifugal feeders but the only way to understand how it all ties together is to work with mentor. Hoosier Feeder Company recruits passionate men and women young and old to learn from masters of the craft to ensure we can deliver excellent machinery now and in the future. If you would be interested in learning the trade don’t hesitate to reach out and apply online or at our facility!